Nintendo has announced that it is getting into the VR gaming business - in a way. The firm has published product pages outlining two new 'Simple, Friendly, Fun" cardboard kits that allow children and families to build their own VR gizmos, which will be powered by the Switch console. These 'Toy-Con' kits join the three previous releases; the Variety kit, Robot kit, and Vehicle kit. Strictly speaking there is just one dedicated VR kit, the Toy-Con 04 VR Kit, but it will be available in two configurations. The Nintendo Labo: VR Kit will be available at a suggested retail price of $79.99 and includes materials to build all six Toy-Con projects – the Toy-Con VR Goggles, Toy-Con Blaster, Toy-Con Camera, Toy-Con Bird, Toy-Con Wind Pedal and Toy-Con Elephant – as well as a Screen Holder and Safety Cap. Of course accompanying software is supplied too. Nintendo promotes this kit as offering "the full experience". 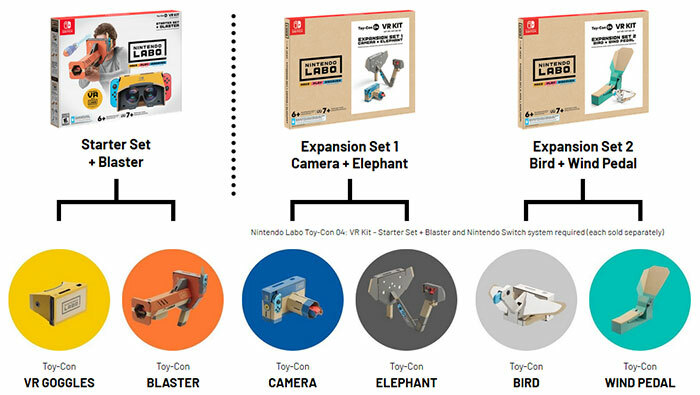 Nintendo Labo: VR Kit – Expansion Set 1**: Available at a suggested retail price of $19.99, Expansion Set 1 includes the Toy-Con Elephant and Toy-Con Camera. 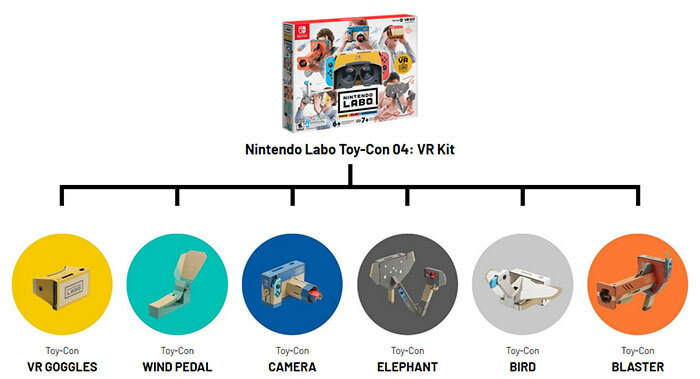 Nintendo Labo: VR Kit – Expansion Set 2**: Available at a suggested retail price of $19.99, Expansion Set 2 includes the Toy-Con Wind Pedal and Toy-Con Bird. Our embedded product diagrams help make sense of the above VR kit options. Durprisingly the cost of the Nintendo Labo: VR Kit – Starter Set + Blaster plus the two expansion kits adds up to less than the main Toy-Con 04 VR kit. Hopefully, Nintendo will reveal more about the mini-games that these cardboard constructions will relate to - the VR experiences on offer. We do know that Nintendo will make all the games playable in 2D mode as well as with the 3D goggle constructions. Nintendo gaming fans will have to wait until 12th April for these VR kits to make it to retail (US date and prices provided). Nintendo's last foray into VR was the ill-fated Virtual Boy circa 1995. So its (very slightly) cheaper to buy the 3 separate sets than it is to buy the pack that contains them all. Way to go Nintendo. Ummm isn't the resolution of the switch way too low for this to make any sense? But I guess it's just a toy you use once and then throw away like the other Labo stuff. Did you forgot the story with the melon pricings? something like 1 melon is 3 (money), 3 melons are 10 (money) so a guy buys 1 melon then asks to buy another one and then again asks to buy another one, and then starts to laugh in the face of the seller that he bought them cheaper that way, then the seller tells him, that only made him buy 3 melons instead of just one. So its just marketing, and its better to just replace what you broke cheaper.